A very quick post for the Stempelwinkel challenge (shades of brown) and the Designs by Ryn customer creations challenge. I wanted to turn the small hummingbird (from Designs by Ryn) so it looks to the left. I stamped the bird on tissue paper, painted with acrylic paints and adhered with Satin Glaze to a piece of canvas that has been painted with brown acrylics, and embossed with gold. This way it is also possible to get a good clear stamped image on a textured background. 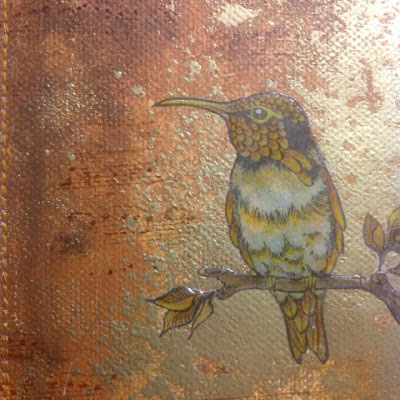 I covered the bird with Glossy Accents, and once it was dry I felt something more was needed, so I used a music background and Stazon ink in the background. 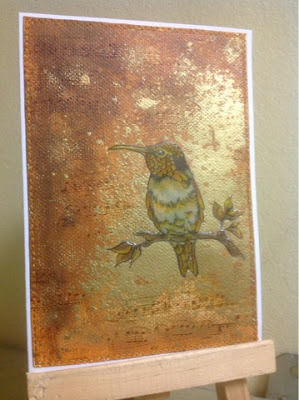 Beautiful canvas, the Glossy Accents make the bird pop out, even when it's not yet dry! The golden shine of the background makes this work very special. Thank you for entering the challenge at De Stempelwinkel! By the way... the challenge will end next week, the 26th! So please update when the GA is dry!